The Wenatchee Valley Fly Fishers, the Inland Empire Fly Fishing Club and the Washington Council of FFI are working with Washington Department of Fish & Wildlife managers on the design and message. The Washington Council and fly clubs will pay the cost of making the signs and WDFW will have final say on the wording and location. The plan is to install three signs, one for each parking lot, says Jerry McBride, conservation chair for the Inland Empire Fly Fishing Club. The upper portion of the signs would spell out the WDFW special rules for Rocky Ford Creek and the lower part would give information on best practices for catch and release. 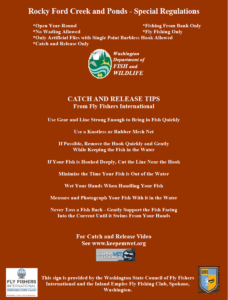 Release practices spelled out on the Fly Fishers International (FFI) website would be on the sign along with a link to the KEEPEMWET website which has an excellent on-the-water video showing how to minimize the impact on the fish during catch and release.